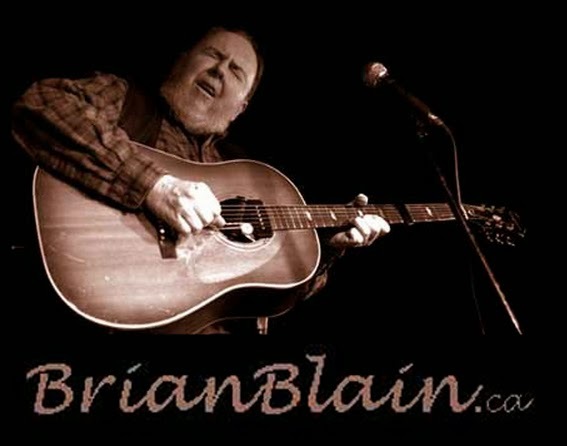 TORONTO -– WEDNESDAY, JANUARY 12TH, 2011 -– Singer, songwriter, storyteller and bluesman Brian Blain kicks of his three-month “CD Celebration and Tour” with the release of the free online single "THE OLD WHALER'S CONFESSION" on Tuesday, January 18th, 8 pm, at the Gladstone Hotel Melody Bar. Guitar-picker Blain and renowned jazz bassist George Koller will perform selections from the upcoming album NEW FOLK BLUES, followed by a campfire jam with many musical friends. "The Old Whaler's Confession"”is inspired by a whale-watching expedition Blain took at the tip of Cape Cod. "There's a huge feeding ground, Stellwagen Bank, just off of Provincetown,"” he says. "The boat barely got out of the port and we were surrounded by whales. "” Blain had once heard bassist George Koller making some amazing sound effects with the bow, that imitated whale calls, and so originally had him in mind for the whaling song (though he ended up playing on the complete album). Whale cries, as reproduced by Koller, introduce the song, which is about "how (in the 1600s) you could walk across their backs right to Boston" before the whaling trade took its toll on these magnificent creatures. But the whaling song is only the beginning. Over the next three months Blain will issue three more free downloads (including one in French); put out a nine-song album, New Folk Blues, both in CD format and an extended live version streaming online at www.myspace.com/brianblain; tour throughout Ontario and Quebec and collaborate with his professional DJ son Joel on a mash-up” of one of the songs, complete with beats and loops. New Folk Blues was recorded live at Reba’s Café in Toronto’s west-end Junction district, with only Blain and Koller performing. While the CD is slim and trim, sans long introductions, Blain decided to offer an online version that includes his intros plus the full length "seascape" by Koller, full of whale, seagull and surf sounds. Blain plans to add overdubs to some of the tunes as well, so what started out as a "live" CD has become, in a way, a "living" CD. The album also features “"Another Song About Alice",” which references the 1960s cult folk music legend Alice Brock of “"Alice’s Restaurant"” (Brock, a great supporter of Blain’s work, lives in Provincetown, where Blain frequently visits); “"Ghost of Clinton's Tavern",” about the well- known Toronto “haunt”; a tribute to guitar hero Lenny Breau and “"The Day Coke Saved The Blues",” describing how a TV commercial song placement saved the Northern Blues record label that Blain had been affiliated with. The Toronto-based Blain, originally a native son of Sherbrooke, QC, has been on the Canadian music scene for nearly 50 years. In 1963, he first recorded with a folk group whose payment for the session was "a trip to Montreal and a steak dinner." These days he’s best known as the host of the monthly campfire”jam sessions held at the Gladstone Hotel, where he encourages both novice and veteran musicians to join together in the joyful communion of music. For Blain, playing music is almost like breathing. "Some people study the masters and practice diligently," he says, "and some, like me, who never had a guitar lesson in their life, just have music rolling in their heads 24/7."